When I began Low End Mac ten years ago, there were no G3 Macs. When Apple introduced the first G3s, which were about 50% more efficient than earlier PowerPC 604e CPUs, everyone was excited. When Apple releases Mac OS X 10.5 Leopard in October, there will be no support for G3 Macs. The first G3 Macs, the PowerBook G3 and beige Power Mac G3, were introduced in November 1997. The 250 MHz PowerBook G3 was the world's most powerful notebook, and the 266 MHz Power Mac G3 held its own against the Power Mac 9600 with a 350 MHz 604e CPU. The last G3 Macs, the 12" iBook and 14" iBook, were discontinued in October 2003. The fastest G3 Macs were those upgraded with a 1.1 GHz PowerForce upgrade (recently reintroduced at 1.0 GHz for US$140). The best selling G3 Macs were the iMacs, which took the market by storm in 1998, going through two major versions and numerous revisions between the 233 MHz Bondi blue iMac of August 1998 and the 700 MHz iMac that was phased out in March 2003. The question is: What does the future hold for G3 Macs? Today we'll look at G3 iMacs. Steve Jobs announced the iMac on May 6, 1998 and let the media hype machine build an audience for it until its August 15, 1998 release. That's not much different from what he did with the iPhone. The iMac was a breakthrough in many ways. It was the first consumer G3. It was the first Mac, except for a few small PowerBooks, without a floppy drive. It was the first Mac since 1986 without SCSI. It was the first Mac since 1987 without an ADB mouse and keyboard. It was the first Mac to embrace the emerging USB port. But most of all, it looked different. 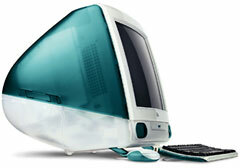 Compared with earlier, boxier all-in-one designs, the iMac was positively curvaceous - and colored to boot! It looked like something out of The Jetsons, except that their computers were blandly white. The iMac's specs were adequate: a 233 MHz G3, 32 MB of RAM, a 4 GB hard drive, a 24x CD-ROM, and ATI Rage IIc graphics that supported up to 1024 x 768 video on the built-in 15" display. There was a v.90 modem, ethernet, and a pair of USB ports. And IrDA, a 4 Mbps infrared protocol that would disappear with the 266 MHz iMac. Equally important is what was missing. There were no expansion slots. There was no way to connect legacy Mac peripherals, whether SCSI, serial, or ADB. Even the mouse and keyboard were different. The round USB mouse, widely known as the "hockey puck" mouse, earned much derision. It was the world's first computer mouse that you couldn't feel being in the right direction or askew, leading to some unexpected cursor movement at times. The iMac's USB keyboard was small, had decent key action, but deleted a few keys Mac users were used to F13, F14, F15, End, and (forward) Del. Still, it sold like gangbusters, and over the course of eight months Apple revised the design three times. Revision B (Oct. 17) included Mac OS 8.5 and had ATI Rage Pro graphics with 6 MB of video memory. Rev. C (Jan. 4) bumped the CPU speed to 266 MHz gained a 6 GB hard drive, and came in five fruity flavors: tangerine, grape, lime, blueberry, and strawberry. It sold for $100 less and lost the IrDA port. The final version of the tray-loading iMac came out on April 14, 1999. It ran at 333 MHz and had ATI Rage Pro Turbo graphics. All of these iMacs came with 32 MB of RAM and can be expanded to 192 MB officially. Unofficially, some iMacs work with some 256 MB modules, making it possible to reach 512 MB. However, we've never found any way to predict in advance which iMacs will and won't support 256 MB modules - the same module in two seemingly identical iMacs may be recognized in one and only seen as 128 MB in the other. For all practical purposes, every tray-loading iMac can be upgraded to 256 MB, and the internal hard drive can be replaced by one as large as 128 GB. However, if you want to run Mac OS X on one of these iMacs, it must be installed on the drive's first partition, and that partition must be no more than 8 GB in size. Tray-loading iMacs run best under the Classic Mac OS, particularly Mac OS 8.6 through 9.2.2. They are decent performers with OS X 10.2 and work nicely under 10.3 with lots of memory. It is possible to install Tiger, but it's neither supported by Apple nor recommended by us. There are just too many bottlenecks in the design for it to run well, and Tiger really wants 512 MB of RAM. These iMacs will continue to do what they've been doing for years - and doing it well. There is no reasonable chance of running Leopard (OS X 10.5) on them, so stick with what works. Apple unveiled redesigned iMacs on Oct. 5, 1999. The new "Kihei" models replaced the tray-loading CD-ROM drive with a slot-loading mechanism, were a bit smaller and lighter than earlier iMacs, had transparent plastics, and were designed so they wouldn't need a cooling fan. Other improvements included a 100 MHz system bus (up from 66 MHz), ATI Rage 128 VR graphics on a 2x AGP bus, two separate USB controllers, a place to install an AirPort card, and FireWire on all 400 MHz and faster models. The slot-loading iMacs also had a faster drive bus. 64 MB of memory was the norm, and all of these models can be expanded to a full 1 GB of RAM using a door on the bottom of the computer. The first generation Kihei iMacs came in a blue 350 MHz CD-ROM model, a 400 MHz DVD-ROM model in the same fruity colors as Rev. C and D iMacs, and a 400 MHz Special Edition DVD-ROM model in a graphite finish. These all had a 512 MB level 2 cache running at 40% of CPU speed. Nine months later, Apple brought out an improved iMac line at the New York Macworld Expo. The most obvious change was colors - indigo, ruby, sage, and snow replaced the fruity colors. The 350 MHz entry-level CD-ROM model came only in indigo, the 400 MHz CD-ROM model in indigo and ruby, the 450 MHz DVD-ROM model was also available in sage, and the 500 MHz top-end iMac came in snow and graphite. The next revision came in Feb. 2001, when Apple abandoned DVD-ROM drives and embraced CD-RW drives. 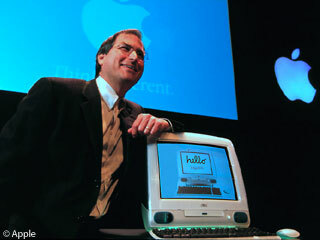 The entry-level iMac moved to 400 MHz and was the only CD-ROM model. A step up was the 500 MHz iMac with CD-RW, available in indigo, Flower Power, or Blue Imation. At the top of the simplified line (only three models) was the 600 MHz iMac, which came in graphite, Flower Power, and Blue Dalmatian. With the February revision, Apple began using the PPC 750CXe CPU on the 500-600 MHz iMacs. The newer CPU has an onboard 256 KB level 2 cache that runs at full CPU speed. The final revision of the G3 iMac came out in July 2001. It included a 500 MHz CD-ROM model, a 600 MHz CD-RW model, and a top-end 700 MHz CD-RW model. The G3 iMac was replaced by the first G4 iMac in January 2002. Unlike tray-loading iMacs, there are no 8 GB partition or memory recognition issues here. All models have an UltraATA hard drive and can support up to 128 GB - also a full gigabyte of RAM. Some have 8 MB of video memory, while others have 16 MB, which gives them better video support, especially in OS X. For a full overview, see our Quick Guide to CRT iMacs. These iMacs handle OS X 10.2 and 10.3 quite comfortably. As always, more RAM and a faster hard drive will help. And they can run Tiger decently, as they support 1 GB of RAM, which really helps unleash Apple's current OS. Our advice is to stick with Mac OS 9.2.2 for the best Classic experience and 10.3 if you want a really good OS X setup. 10.2 will run nicely, but 10.3 supports more modern apps, while 10.4 is somewhat more resource hungry and will run a bit more slowly than 10.3 on these iMacs. Next time we'll look at G3 iBooks. Go to the Older Macs in the Age of Leopard index.